Panerai Radiomir Brevettato 3 Days | New Watch Release | Watchfinder & Co.
As both the end of the year and SIHH 2017 steam toward us at an alarming rate, we’re starting to see teaser previews trickle out to us in dribs and drabs to pique our interest for the international watch trade fair. 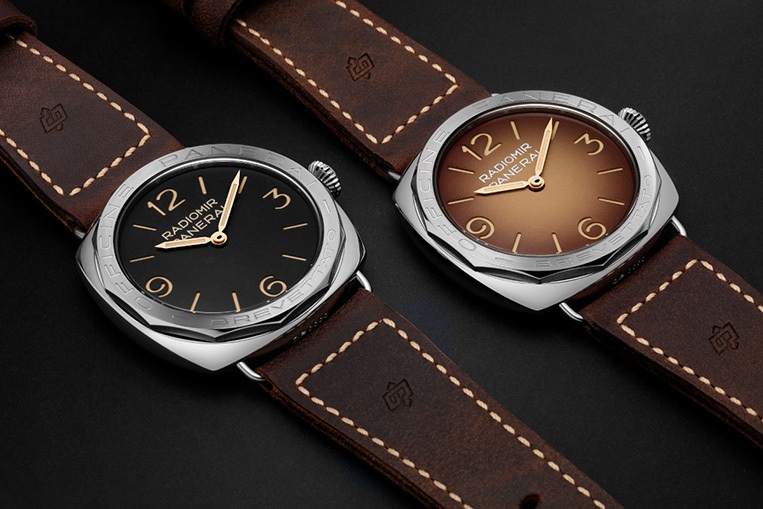 Panerai’s sneak peak of the Radiomir 3 Days Acciaio Brevettato PAM685 and PAM687 special edition watches have certainly done just that. Not surprisingly, the pieces draw from Panerai’s substantial and impressive history with the Royal Italian Navy and are beautiful examples of the brand playing to its strengths. The watches take their inspiration from prototype Radiomirs made by the brand for the navy in the 1930s. Just like the originals, the pieces feature a special 12-sided bezel, engraved with the words ‘Officine Panerai Brevettato’, in reference to the patented ‘Radiomir’ luminous substance used on the dial to make it as highly visible as possible when on the wrist. The watch appeals to a vintage aesthetic, with a simple, uncluttered sandwich dial—which is black for the PAM685, and faded brown for the PAM687—and indices picked out with luminescent Super-Luminova. Both watches feature the distinctive faceted bezel, which really complements the minimalist look of the dial and is a nice homage to Panerai’s military beginnings. The Italian watchmaker has never been a brand to shy away from an oversized case, and the PAM685 and PAM687 are no different. The stainless steel case measures 47mm, and is unmistakably Panerai. The watches are powered by the manual-wind P.3000, which is created entirely in-house in the Panerai Manufacture in Neuchâtel. It offers a power reserve of three days and has an hour hand that the wearer can adjust independently for ease when setting the time when changing timezones. The PAM685 and PAM687 are both solid, good-looking Panerai watches, and they’ve got us excited about what else is in store at SIHH 2017.